On Wednesday 23 March 2016 we were treated to an excellent talk by Dr Fergus Heffernan in the Abbey Court Hotel. 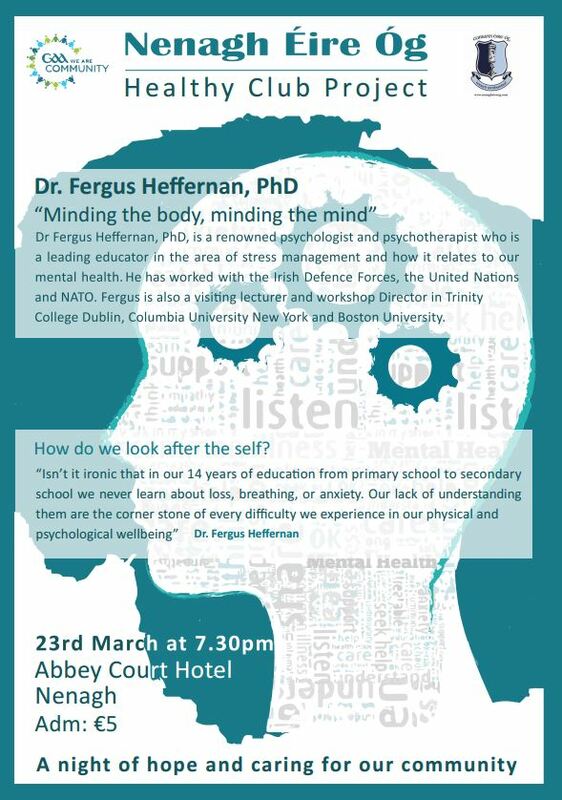 Heffernan is a world renowned psychologist and psychotherapist having previously worked with US soldiers returning from the front in Iraq and Afghanistan, the Irish Defence Forces, the United Nations and NATO as well being a leading educator in the area of stress management and how it relates to our mental health. In an emotional, poignant and often times hilarious talk he spoke openly and honestly about his own family upbringing and how they were affected by mental health issues and how we can carry personal baggage from generation to generation. He used statistics and facts to paint a shocking and realistic picture of society in Ireland today and the effects modern living and expectations is having on our youth. No longer are children out and about, playing, climbing trees and just having fun and more importantly learning from their experiences on how to deal with all that life throws at us. Society today instead demands results, whether it be in school, the workplace or the GAA field and once people fail to meet the standards demanded they are told that they are not good enough. This in turn is leading to huge mental health issues in Ireland today. Our drinking and drug use has gotten totally out of control and yet we are not being honest and facing up to the reality of the situation. Instead we blame others for our own ills and fail to be honest with ourselves and take responsibility. Heffernan’s message was simple. We must focus on the family and its importance in the community as a whole. People, he argues, simply need food, shelter and a sense of belonging which can only come from the family and community to be happy. The packed event was organised by the club’s Healthy Club Project and a huge thanks must go to Michael Geaney, Sr Clare Slattery and the entire committee for all their hard work in organising this well worthwhile event. A huge crowd attended with some travelling from as far as Portumna and Cork while numerous people from neighbouring parishes were also present. We wish to thank Dr Heffernan for delivering the talk which was widely enjoyed by all who attended. 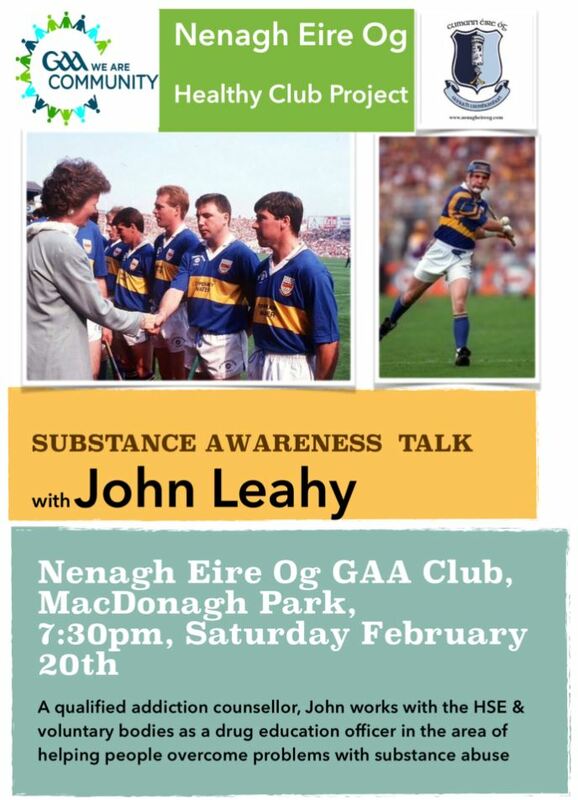 Our thanks to former Tipperary hurler John Leahy on giving a superb enlightening talk titled ‘Substance Awareness” last Saturday evening in the Complex. He spoke to the many teenagers in attendance and their parents about the dangers of substance abuse at a young age and also gave a fascinating insight into his own sporting life both on and off the field. The Nenagh Éire Óg Healthy Club Project team are asking members of the club and the community to complete a simple online questionnaire. The aim of the questionnaire is to gather the views of the community in order to ascertain what impact the Healthy Club Project has had on them. To complete the anonymous questionnaire please click here. The Nenagh Éire Óg Healthy Club Project will host a ‘Night with Christy Kenneally’ in the Scout’s Hall on Wednesday, April 15th at 8pm. The theme of his talk is “from heartbreak to hope”. 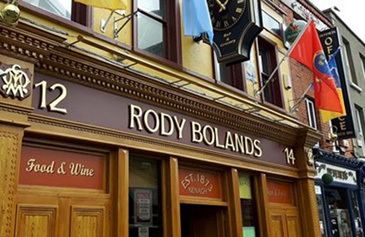 Admission is priced at €5 while under-18s will be admitted for free. Born in Cork in 1948, Christy Kenneally is a veteran broadcaster and author of numerous publications, including the best-selling book ‘Living with Loss’. Christy is well-known for his work in communicating with the terminally ill and the bereaved. The former presenter of RTÉ’s ‘No Frontiers’ says that we can become paralysed by the sudden losses which can bring significant change to our lives. Christy scripted and presented a series for television on the great religions of the world, as experienced through their art and architecture which was entitled ‘Heaven on Earth’. 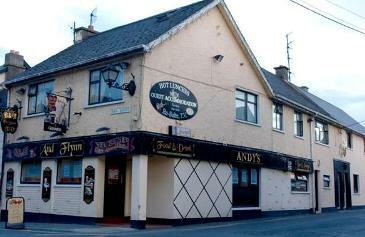 Christy is a graduate from the National University of Ireland with a Bachelor of Arts Degree and a Bachelor of Divinity. He has his own management training company with an extensive list of corporate clients including IBM, Lotus, Motorola, Analog Devices, O2 and the Mars Corporation. 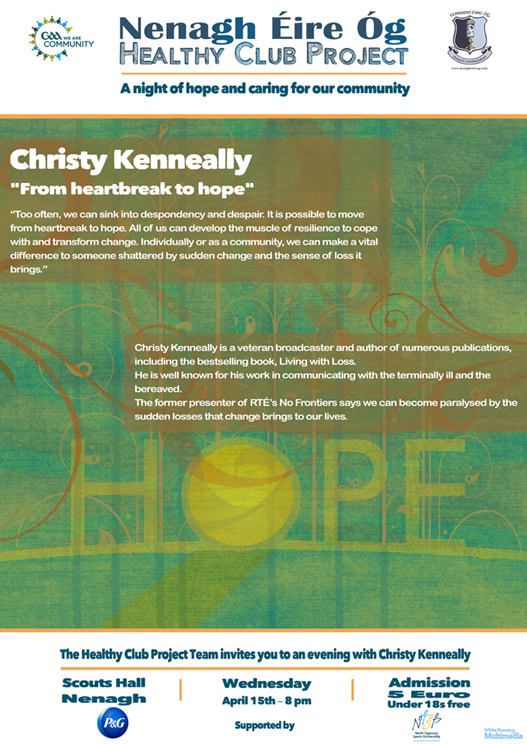 Christy is a very perceptive and humorous speaker. He engages easily with his audience and is highly entertaining while at the same time delivering the keynote messages eloquently and with impact. He is a much in demand keynote and motivational speaker at conferences worldwide. Tipperary senior hurling manager Eamon O’Shea pictured with Clare Slattery and Michael Geaney at the Nenagh Éire Óg stand in Croke Park. Nearly three hundred delegates attended the conference. During her presentation Stacey Cannon (Community and Health Department in Croke Park) spoke about Nenagh Éire Óg. She referred to the club’s annual report where the Healthy Club Project is very much part of it. 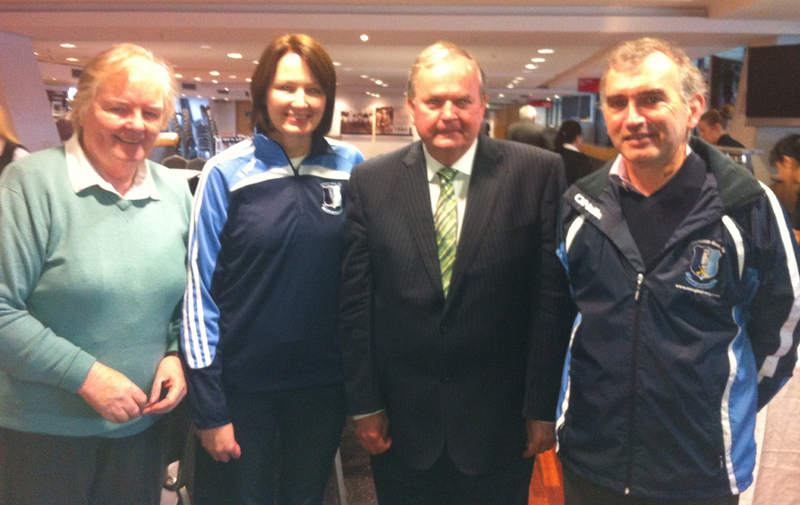 She said that all clubs should aspire to having health and wellbeing at the centre of its ethos, like Nenagh Éire Óg. All the presentations from the conference will all be available on the GAA website in the coming weeks. The team met with many delegates from all over the country who were so positive and full of praise for Nenagh Éire Óg Healthy Club Project. They took photos of the club’s posters, wanted to know all about the club’s initiatives on wellbeing , mental health and anti-bullying. Many took copies of the club’s newsletters, annual report and details about the club’s website etc. The team also met with Caroline McGuigan (CEO of Suicide or Survive). Caroline thanked Éire Óg for the club’s partnership with SOS in running the Wellness Workshop last January in Nenagh and said that the facilitators who gave the workshop spoke very highly of the way it was organised. Others who visited the Éire Óg stand were Eamon O’Shea (Tipperary senior hurling manager) and Conor Cusack (Cloyne, Cork). Eamon has a great interest in the elderly and has been responsible for numerous reports commissioned by national and international agencies on Ageing and Older People. Eamon O’Shea has agreed to come to Nenagh to give a talk on the elderly and their importance in a club and community – details of same will be confirmed in the coming weeks. All the clubs who took part in the Healthy Club Project Phase One were presented with a certificate by Ciarán Mc Laughlin, Chairperson of the National Health and Wellbeing Committee. A brilliant day for Nenagh Éire Óg! All of material which was on display at the conference is available to view on the Healthy Club Project section of www.nenagheireog.com. 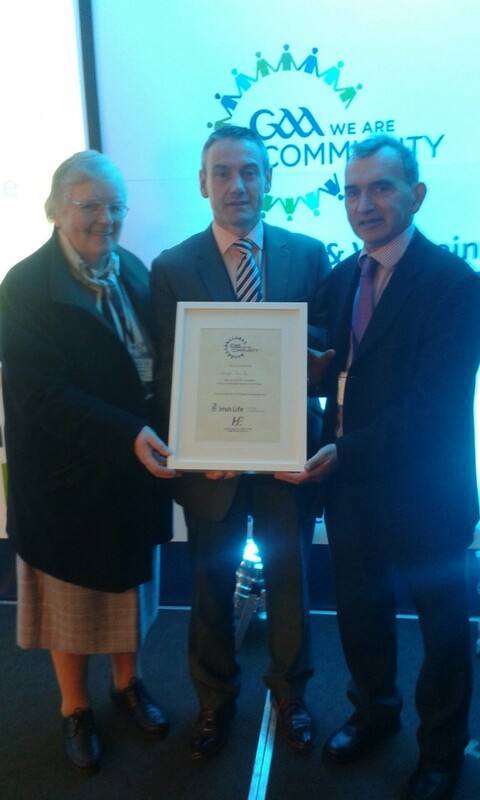 Ciarán McLaughlin (Chairperson of the National Health and Wellbeing Committee) pictured presenting a Healthy Club Project Certificate to Michael Geaney and Clare Slattery. 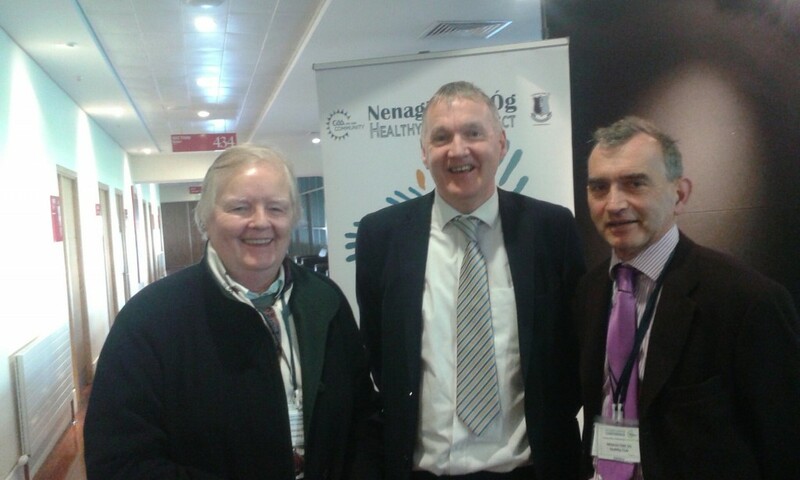 The Nenagh Éire Óg Healthy Club Project Stand pictured at the recent GAA Health and Well Being Conference. 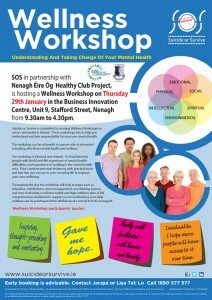 The Nenagh Éire Óg Healthy Club Project team, in partnership with SOS (Suicide or Survive), will host one-day Wellness Workshop which aims to help people understand, take charge of and responsibility for their own mental health – this Workshop, which will be delivered by SOS, takes place on Thursday, January 29th in the Business Innovation Centre on Stafford Street, Nenagh. The workshop is free of charge to participants. The workshop will be of benefit to anyone who is interested in mental health and wellness. Participants will be facilitated by people with both lived life experience of mental health difficulties and people with experience of working in the mental health area. Personal testimony will be combined with practical tools and tips that you can use in your everyday life to improve your own wellness. The workshop will examine our thinking process, the wellness continuum, mindfulness, personality traits, and the ‘wheel of change’. This is all done in a very interactive non-intrusive and fun way. Areas covered on the day include relaxation and stress management, understanding the relationship between thoughts and emotions, developing a wellness toolkit and daily plan. Places on the workshop are limited. Please contact Jacqui or Lisa at SOS to reserve your place – 1890 577 577. 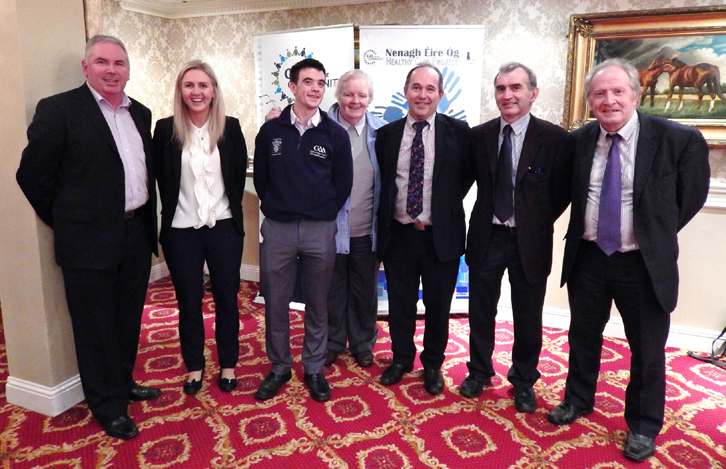 The GAA’s Health and Well-Being Coordinator Stacey Cannon commended the work of Nenagh Éire Óg at a seminar which featured renowned psychologist Shane Martin at the Abbey Court Hotel on Wednesday evening, November 19th. Nenagh Éire Óg club chairman Jim Nagle and members of the Healthy Club Project team pictured with the GAA’s Stacey Cannon and renowned psychologist Shane Martin at the Abbey Court Hotel. 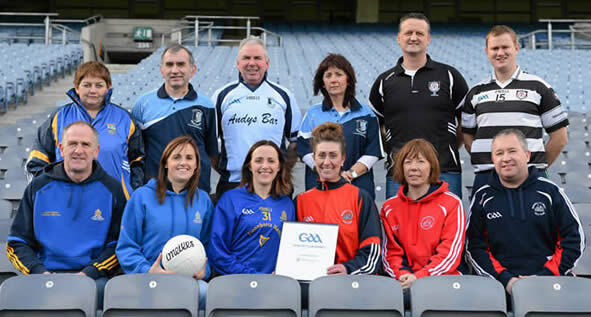 In 2013 Nenagh Éire Óg volunteered to participate in a two-year pilot programme entitled the GAA Healthy Club Project. Speaking at Wednesday night’s health and wellbeing seminar Stacey Cannon said that she wished to acknowledge the commitment of Nenagh Éire Óg to the project and the determination of the club to address the stigma which is sometimes association with mental illness. The pilot programme will move into phase two in March 2015. The GAA Healthy Club Project was inaugurated to take advantage of the Gaelic Athletic Association’s unique access to people and to use the power of the association to influence individuals in particular and the community in general in a positive way. 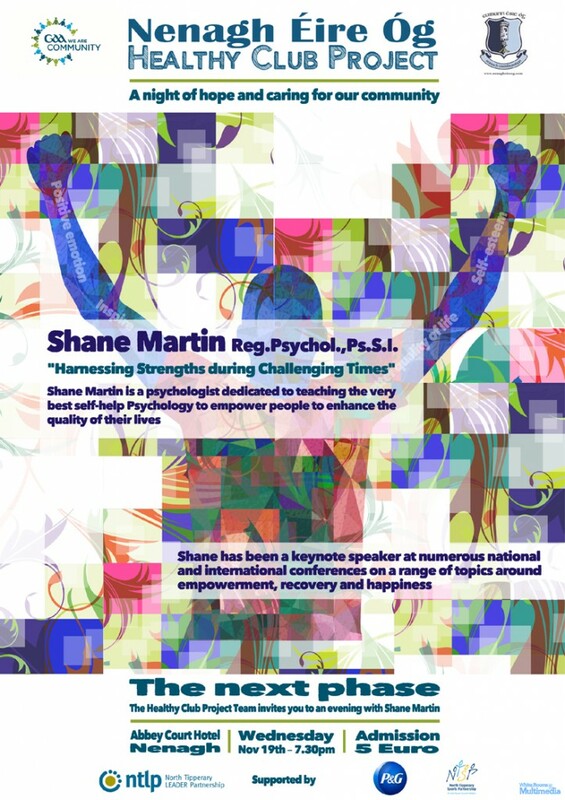 Psychologist Shane Martin regaled a large attendance at the seminar with a presentation entitled ‘Harnessing strengths during challenging times’ – Shane Martin is a Monaghan-based psychologist dedicated to empowering individuals to enhance the quality of their lives. Speaking from professional experience Shane Martin spoke passionately about a life dedicated to helping people deal with depression and mental illness. Indeed, Mr Martin pointed out a bias in medical research which focused on the negative while Shane Martin was more interested in people who did not get depression than those who did and those who did not get depression but should have. Shane Martin believes that everyone is entitled to the best possible life, that life is precious; Mr Martin suggested that most people wait until the “train has crashed” before they start thinking about what matters most. The bulk of Mr Martin’s presentation focused of the psychologist’s tips for living a more fulfilling life – those included: to engage in rational thinking, to develop a compassion for self, to unlearn helplessness, to be social, to invest in gratitude, to bask in the now, to do the things we love, to invest in the spiritual self, to take care of your body and, finally, to invest in humour. For those interested the entire content of Shane Martin’s presentation is available on his website Moodwatchers.com – click here. Speaking on behalf of Éire Óg club chairman Jim Nagle suggested that Shane Martin had succeeded in reaching people with his message of hope. Jim Nagle commended Shane for his humour, humility and honesty and insisted that the presentation had “left a permanent impression on everyone” present. Chairman Jim Nagle also commended the Healthy Club Project Team for their tireless work, especially project leader and juvenile chairman Michael Geaney. 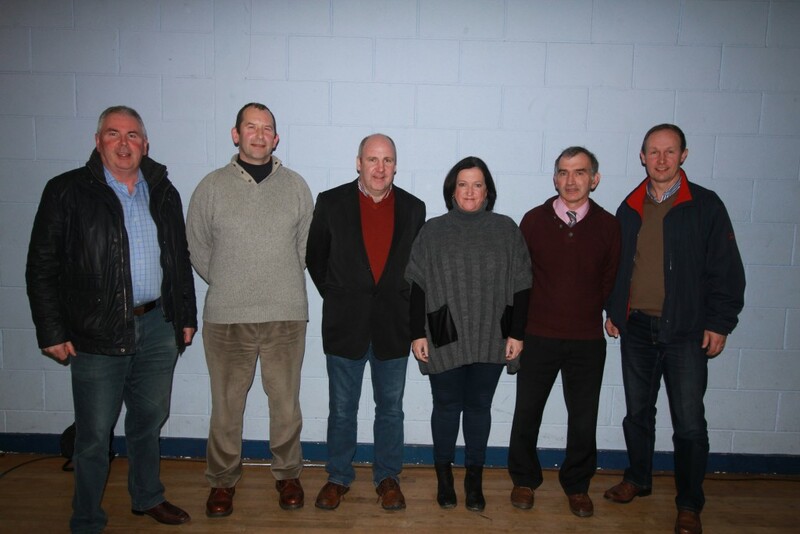 The committee also features Clare Slattery, Nuala Connolly, Catherine McTiernan, Tommy Moylan & Greg Browne. It is with sadness that we inform you that the death of Fr Tony Butler SMA took place on October 16th at Cork University Hospital. Many of you will remember Tony and his meeting with us in the Abbey Court Hotel on June 6th last as part of our health and wellbeing initiative. It was a night to remember where Tony willingly shared his many stories and the ups and downs of life. Fr Tony was a gentle humble Irish Missionary who shared his life with so many in Africa and helped them to find hope and to see life with a different lens. He came back home to Cork and for the past number of years he continued his ministry of giving hope and meaning to so many people. We in the Healthy Club Project Team remember Fr Tony with affection and gratitude for giving so generously of his time to us. Indeed we had spoken to him of giving more time to our project but God called him home. 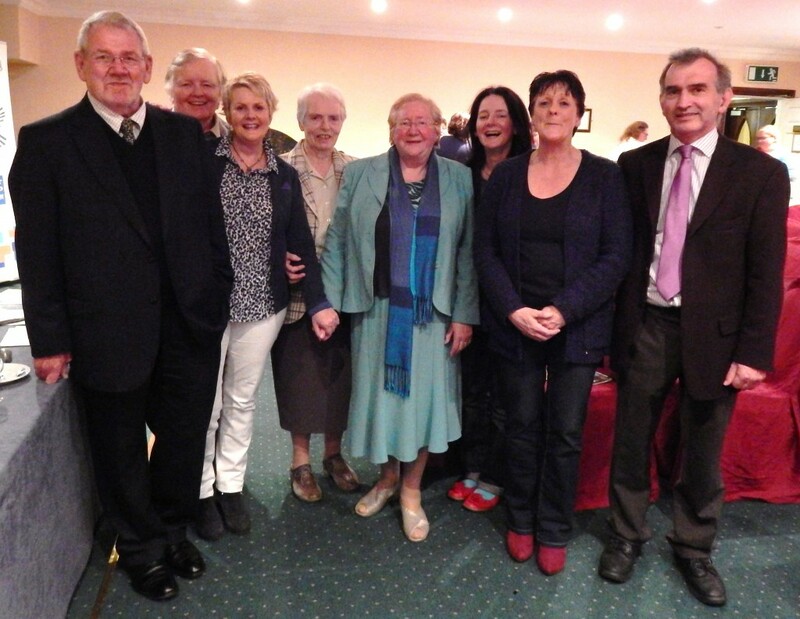 On behalf of all of us in the Nenagh Éire Óg Healthy Club Project Team and all of you who were fortunate to receive his wisdom and his insight we extend our heartfelt sympathy to Fr Tony’s brother Don, his sister-in-law, nieces, nephew, relatives, friends and his fellow priests in the Society of African Missions. Fr Tony Butler pictured with the Healthy Club Project Team. The Nenagh Éire Óg Healthy Club Project team will host the second Well Being & Mental Health Seminar on Friday, June 6th at 8pm in the Abbey Court Hotel. Admission is free. 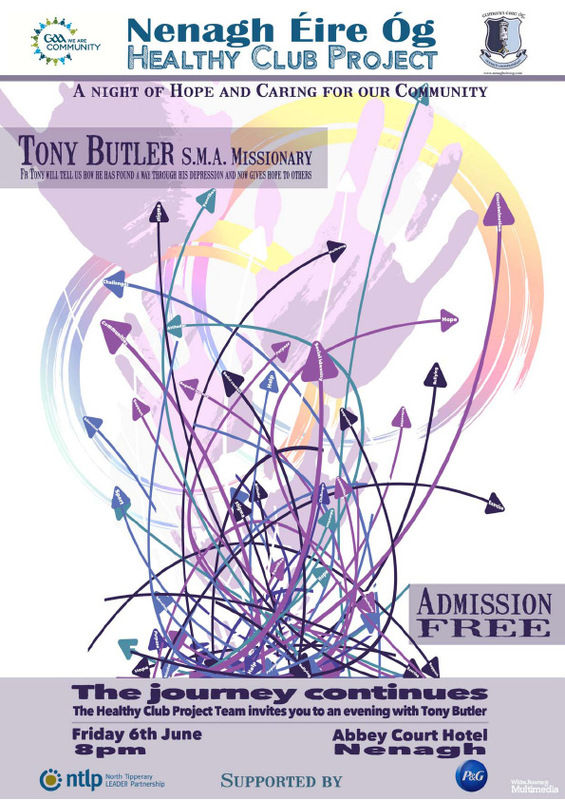 The main speaker on the night is Tony Butler (SMA Missionary). Fr Tony will tell us how he has found a way through his depression and give hope to others. This event is open to all and represents an opportunity for club members and the wider community to become informed on the many issues surrounding depression and mental health. In addition there will be feedback from the team’s first event and the plan for the future. 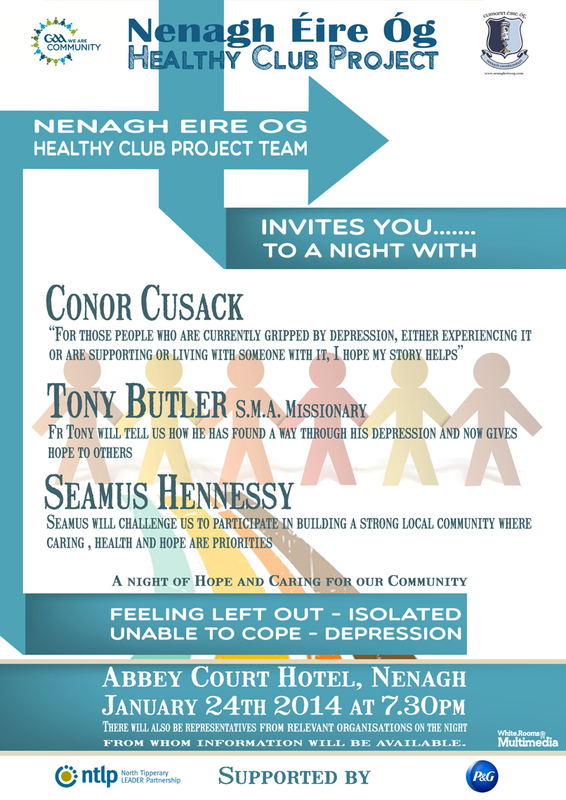 The Nenagh Éire Óg Healthy Club Project team hosted a ‘Well Being and Mental Health’ night on Friday, January 24th at the Abbey Court Hotel. 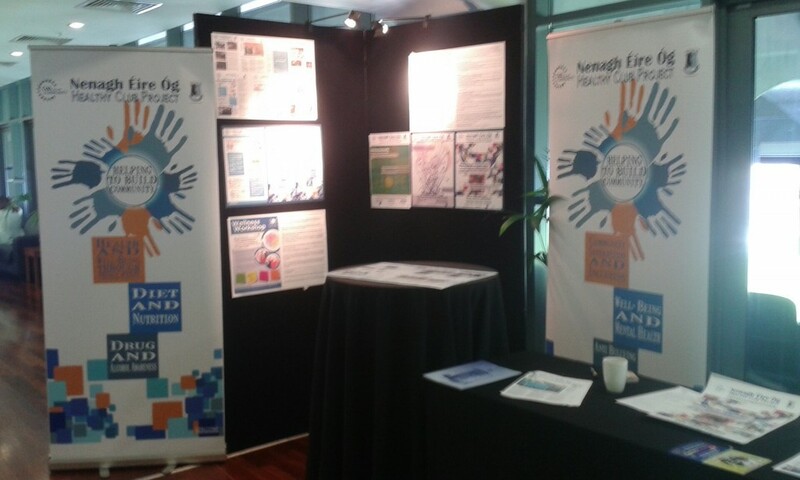 For a full report on the event please click here. 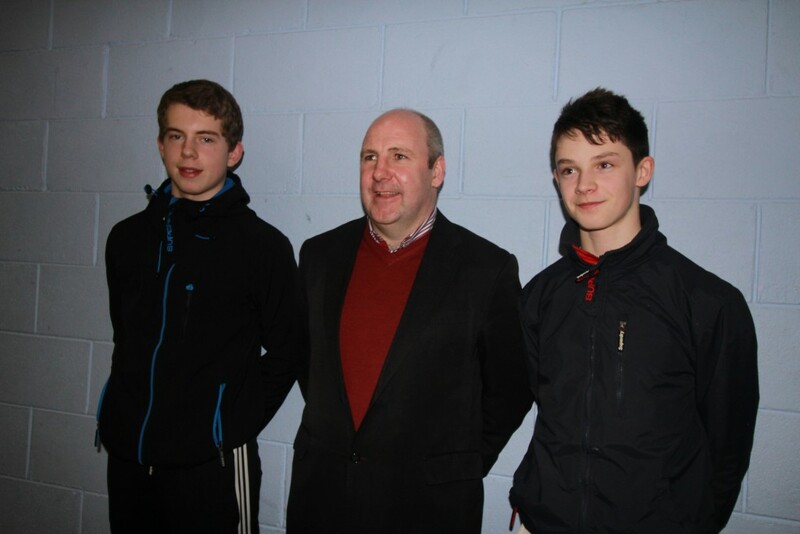 Speakers on the night included Conor Cusack and Séamus Hennessy. The health and well-being of members has been firmly placed at the heart of GAA clubs with the launch of phase one of the new GAA Healthy Club Project. Uachtarán CLG Liam Ó Néill and Chief Medical Officer at the Department of Health Dr Tony Holohan jointly launched the project, reflecting its collaborative nature between the GAA and the HSE. At its core the project aims to assist GAA clubs in responding to the wide and varied health needs of their members while extending that positive influence out to the wider communities they serve. 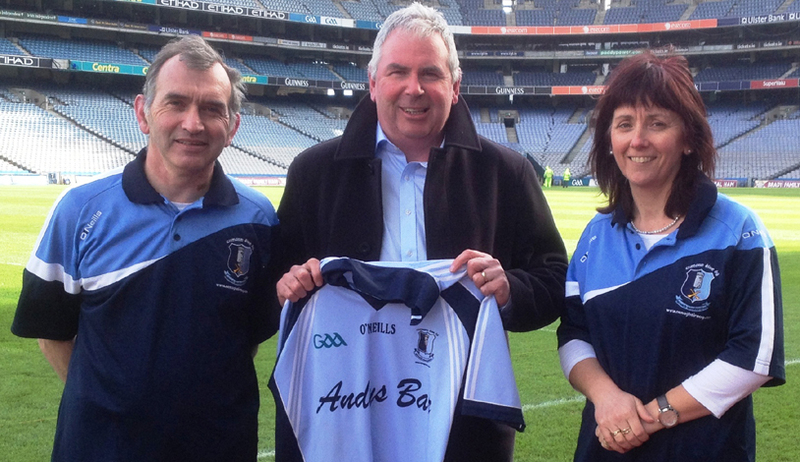 Pictured at launch in Croke Park are Michael Geaney (juvenile chairman), Jim Nagle (club chairman) and Anne Kennedy (juvenile secretary). Nenagh Éire Óg’s Clare Slattery, Nuala Connolly and Michael Geaney attended a workshop on the Healthy Club Project in Croke Park on Saturday, October 12th. 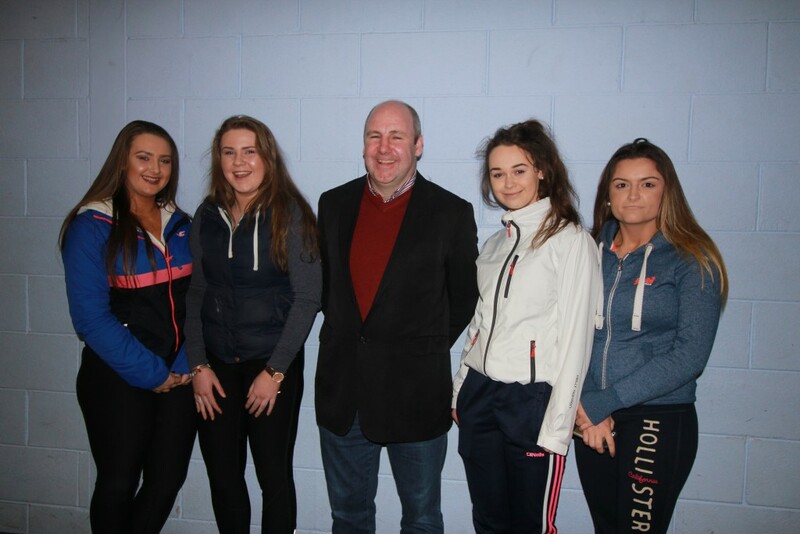 The Nenagh Éire Óg group are pictured with GAA President Liam O’Neill. “The GAA Healthy Club Project aims to highlight and re-enforce the great work already being done by clubs while assisting them in identifying and responding to the most important health issues amongst their membership and in their communities,” Liam O’Neill said at the launch. “This collaboration is an extension of the long-standing partnership between the health sector and the GAA through the association’s ASAP (Alcohol and Substance Abuse Prevention) programme and we hope this project will further assist clubs and their communities to respond to their health needs in a holistic way at grass roots level,” added Dr Tony Holohan. A call for expressions of interest was issued to all clubs last December and January with eighteen clubs selected to participate in phase one of the project which will run for twenty-four months following which time it will be independently evaluated. Five clubs in Munster were selected including Nenagh Éire Óg. The other clubs in Munster are: Middleton (Cork), St Paul’s (Limerick), Beaufort (Kerry) and St Finbarr’s, Cork who are the mentor club. The project is being directed at national level by a Croke Park project team and steering committee featuring representatives from the GAA, HSE, National Office of Suicide Prevention, the third level education sector (DCU and Carlow IT) and the Irish Sports Council. Four operational groups will assist in its roll-out at provincial level, tapping into support and expertise at GAA provincial council level, Local Sports Partnerships and regional Health Promotion units plus their northern counterparts. The clubs will also be encouraged to reach out to their wider membership and communities in order to tap into some of the exceptional skills people have in this area. Michael Geaney is the project leader for Nenagh Éire Óg – Michael’s contact details are – phone: 086 383 0857 – eMail: michaelgeaney1@yahoo.ie. Click here for more information on the GAA’s Healthy Club Project! 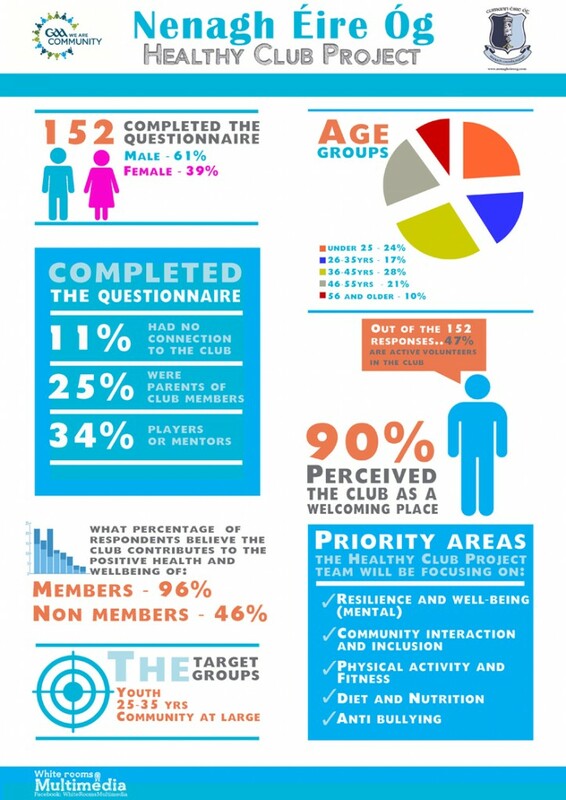 This handy infographic contains the results of the recent questionnaire carried out by Michael Geaney and the Healthy Club Committee – some interesting statistics.